The N.C. Chronicles. 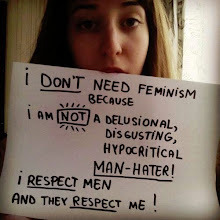 : Are feminists anti-social sociopaths? In my experiences with the local feminists of lanark county ontario, I would have to seriously say...YES. Humour aside, the description below perfectly describe those I came up against. While the agenda is 'anti-male' it is more than that, dividing the family, polarizing the sexes and creating chaos, often ignoring the causal problems of much of today’s social programs which are health issues and often involve addictions, addictions to alcohol or drugs, even prescription drugs. Even the Mayo Clinic identifies such elements in our society, as 'anti-social' who are quite able to maintain jobs, but have no conscience or concern for right and wrong. Judging by many of the anti-male, anti-family social programs, the problem has existed for decades and no one has been able to deal with it, probably because the 'threat' is a deceptive one. "Antisocial personality disorder is sometimes known as sociopathic personality disorder. A sociopath is a particularly severe form of antisocial personality disorder. " Logic would suggest that such people would be quite eager to polarize issues and groups and create chaos and even war, rather than find simple solutions. Antisocial personality disorder is a type of chronic mental illness in which a person's ways of thinking, perceiving situations and relating to others are abnormal — and destructive. People with antisocial personality disorder typically have no regard for right and wrong. They may often violate the law and the rights of others, landing in frequent trouble or conflict. They may lie, behave violently, and have drug and alcohol problems. And people with antisocial personality disorder may not be able to fulfill responsibilities to family, work or school. Antisocial personality disorder is sometimes known as sociopathic personality disorder. A sociopath is a particularly severe form of antisocial personality disorder. It's unlikely you'll be able to convince a person with antisocial personality disorder that he or she has a problem — much less convince him or her to seek care. Make your own well-being your priority. Ask your doctor to refer them to a mental health provider who has experience helping people affected by antisocial personality disorder. A therapist familiar with this condition can help them learn how to cope. So, when you come up against a feminist, don't argue with them, you are loosing your time, give them the number of a good anti social therapist....lol.